On February 22, dear compatriots, you have descended on the streets to put an end to the FLN’s long-running masquerade. On our side of the border we too once descended on a February. The 20th to be exact. We too demanded an end to a similar type of masquerade. Like you, we came out spontaneously, without any directions from political parties or workers unions or associations. It was pure outrage, and its spontaneity is what brought our King to his knees. And then, suddenly, the parties, the unions, the Islamic jamaat, the NGOs came out of their dark offices into the bright streets to tell us they will helps us, negotiate for us, lead us. Trusting them was perhaps the biggest mistake we made. These organisations were never there to help us or even “lead” us. Like slougis [a type of hunting dog], their purpose was to drive our free-running indignation out of the forest and into an open field where the hunter could more easily shoot it down. The slougi picks it in his jaw and obediently placed it at the feet of the hunter in exchange for a small treat to chew. But how many half-dead indignations— how many Hiraks, Jerradas, Ouerglas, Gafsas, Sidi Bouzids — will be placed at the hunter’s feet before we learn that it is not his rifle we should beware of, but the very path the slougi forces us to take through the forest. Socialists have ruled and misery remains, Islamists have ruled and misery remains, liberals have ruled and misery remains. It seems the problem is ruling itself. History has showed us again and again what happens when spontaneous revolts are tamed by organisations which claim to “represent the people.” You, my compatriots, know this all too well: whether from a cave in the Aures or the heart of the Kasbah, you rebelled spontaneously against colonialism. Yet, the slougi you now know as the FLN drove you back to its feet. 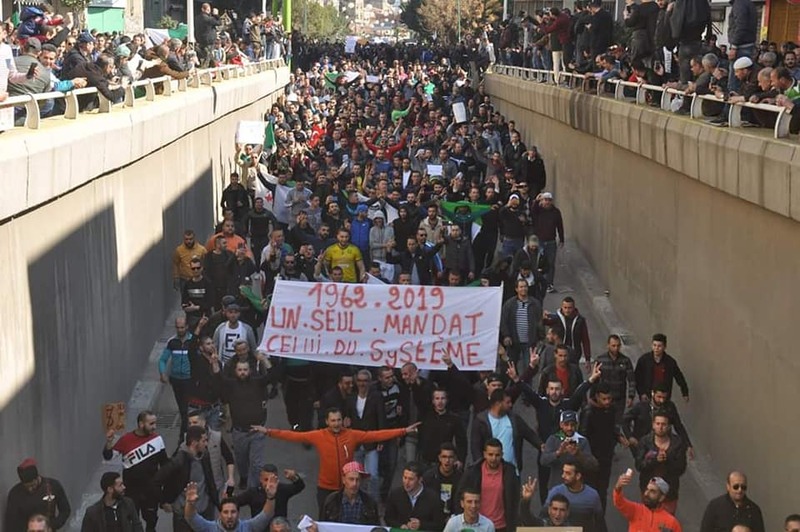 The aspirations of the “seul hero, le peuple” were seized by “representatives” and “presidents” who turned them into a broken-cassette: an endless-repetition of the slogans and songs of revolution until they lost their meaning. They claim the revolution was “organised” by the few when in reality it belonged to the many. I’ve watched the “Battle of Algiers” many times, it’s one of my favourite films. But after many viewings, the scene right after the bombings inside the Kasbah began to catch my attention. In it, the outraged population floods the streets spontaneously— an autonomous, un-directed, collective power made of many autonomous, un-directed individuals. I always wondered what would have happened if the FLN hadn’t held them back by force, if the character Jaafar hadn’t told them “Stay calm! The FLN will avenge you!” Perhaps the film would have ended right there, perhaps the revolution could have been realised much earlier. After all, doesn’t the film end with people taking over the streets spontaneously as the narrator himself recognises when he says “disturbances broke out again without warning, and nobody knows why or how… I spoke to an FLN chief, but he knows nothing either”? Why not take the shorter route without the FLN? Today there are new slougis in your vicinity, and I think you may already know who they are. They will continue to tell you the same thing the nationalists (FLN for you, Istiqlal for us) used to tell our grandparents. First they will say they support you, but soon they will say that you must be pragmatic, that your spontaneity needs “order,” that it may threaten “security,” that you need “leadership.” But is “order, security, leadership” not just a formula for authoritarianism? They will tell you that your comrades in “the disorganisation” can not be trusted, that everyone around you only seeks their own interests, that you’re smart but the others don’t know what they’re doing, that they may become dangerous if they are not organised. But never forget that they will tell your peers the exact same thing about you. But the contradiction here is flagrant! If no one can be trusted, if everyone only seeks their own interests, if everyone can pose a danger, then what makes us different from any president, MP, King or secretary general? Are they not just as human as we are? Are they not just as prone to having the same flaws we all have? If anything, is it not more dangerous to give a small number of people so much power that these human flaws take enormous, devastating, murderous proportions? 1. The freedom of decentralisation over the authority of centralisation. 2. The democracy of Agraw (village assemblies) over the oppression of sultans. 3. The bread of Agadirs (collective granaries) over the taxes of Makhzens. 4. The dignity of Agdals (collective lands) over the greed of private property. 5. The solidarity of Tiwiza (mutual aid) over the inhumanity of slavery. And one day, my dear compatriots, across a border that we will abolish— together.